Kisoro Tours Uganda: 12 days Uganda & Rwanda Safari, Gorilla tours Uganda, tour Rwanda, Rwanda gorilla safaris, Uganda chimpanzee & gorilla’s safari vacations. 12 days Uganda & Rwanda Safari, Gorilla tours Uganda, tour Rwanda, Rwanda gorilla safaris, Uganda chimpanzee & gorilla’s safari vacations. This 12 day safari package combines of the best places to visit while on tour to Uganda and Rwanda. The safari holiday allows one to experience the best of both worlds in Uganda and Rwanda. 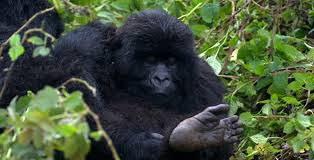 Trek the gorillas twice, 1st in Bwindi and then have a second gorilla trekking serving in Volcanoes National Park Rwanda. In Uganda the safari package takes us to the most game rich national parks, including chimpanzee trekking in Kibale Forest National Park. Enjoy a boat cruise along Kazinga channel, spot the tree climbing lions of Ishasha, meet local people, try local food and buy local crafts. This is a must join safari package for folks wishing to explore authentic Africa while on a dream safari. Meet and greet at Entebbe airport by your safari guide. Transfer Boma Guest House Entebbe. Entebbe is a quiet and relaxed old colonial town. Entebbe is located on the shores of Lake Victoria only 45 kms from Kampala the capital city. There is plenty to see and do in Entebbe including visits to Uganda Wildlife Education Centre and various beaches dotted all over Entebbe. Birders can go birding at Entebbe botanical gardens. Golf enthusiasts can play a round of gold at Entebbe Golf Club. or go for swimming in the cool fresh waters of Lake Victoria. Day 2: Transfer to Kibale Forest National Park, evening Bigodi swamp walk. After breakfast, the tour package sets off from Entebbe, avoiding the chaotic Kampala rush hour traffic. We hit Mityana road very early and head towards Fort Portal in Western Uganda. This is a fairly long drive through beautiful scenic places, pine plantations and villages along the way. We anticipate a stop-over for lunch in Fort Portal town. After lunch in the late afternoon, proceed through long swathes of beautiful tea plantations enroute to Kibale Forest National Park. We arrive and proceed to do a guided Bigodi swamp walk in the Bigodi wetland sanctuary. On the guided tour expect to see many types of primates including the colobus monkeys, black and white colobus monkeys, red tail monkeys, vervet monkeys, L'Hoest monkeys and mangabeys. For avid birders, there is massive birding opportunities in Bigodi. You will be snapping away at papyrus gonoleks, great blue turacos, hornbills, weavers, cuckoos, kingfishers, flycatchers and lots of other bird species that call Kibale their home. Diner and overnight at: Kibale Forest Cottage /Kibale Primate Lodge/Papay Lodge. Day 3: Full day Chimpanzee Habituation Experience or Chimp tracking 4hours. The full-day Kibale Chimpanzee Habituation Experience gives visitors a chance to work with a chimp community which is undergoing habituation. If you arrive early you will get a chance to witness the chimpanzees waking up from their overnight nests between 6:00 - 6:30am before they go about their daily business, mating feeding, looking for food, breast feeding, playing, resting, patrolling and cheekily jumping from tree to tree until about 7pm when they return to build new nests for the night. When you join the chimp habituation expedition, you will participate in the Wildlife Authority initiative to habituate chimps to the presence of human beings while conserving their natural environment. This will arguably be one of the highlights of your Uganda safari package. After breakfast, leaves Kibale Forest National Park and the playful chimps and heads to Queen Elizabeth National Park another wildlife gems in Uganda's tourism arsenal with plenty of cats, buffalos, warthog, bushbuck, waterbuck ,elephants, tree climbing lions in the Ishasha sector of the park, chimps in Kyambura Gorge and plenty of other exciting game watching and birding opportunities.. You will get beautiful views of the legendary mountains of the moons-The Rwenzoris as you drive up to Kasese, a former mining town. There will be plenty of game viewing opportunities along the route the moment you enter into the park as wildlife and animals freely cross the road. Lunch is anticipated at Mweya Safari Lodge your accommodation for the next 2 days. After a brief relaxation at Katara Lodge you will join a lunch trip on the Kazinga channel in the afternoon. The launch trip takes on average 2 hours and is a great opportunity to see wildlife and game as it comes out to the banks of Lake Albert to drink in the beautiful Ugandan afternoon sun. The amount of animals and birds you will see on the cruise, will surely go down as another one of the highlights of your Uganda safari. The launch trip will later be topped up with an evening game drive through the park before retiring to Mweya Safari Lodge for the night. Diner and overnight at: Katara Lodge/Mweya Safari Lodge/ Kyambura Game Lodge. The Kazinga Channel is 36 km long and situated between lakes Edward and George. While on the afternoon boat cruise you will see plenty of elephants, hippos, crocodiles and lots of bird species.Among the birds to be seen are the pelicans, fish eagles, cormorants African skimmers, saddlebilled storks, and many other birds only unique to Uganda. The Kazinga channel separates Queen Elizabeth National Park into the Mweya Northern sector and the Maramagambo Kyambura and Ishasha southern sector. Day 5: Morning game drive, afternoon transfer to Ishasha southern sector. In the morning after breakfast, we go for another game drive this time focusing on the game tracks near the Kasenyi fishing village area. We are sure to see a number of kobs and hippos that concentrate in the fishing village of Kasenyi on the shores of Lake George. We also get the chance to interact with locals who live in these villages and get to understand how the co-exist with the game and wildlife around them. We return to the lodge for lunch before proceeds for 3 hours drive to Ishasha on game drives in search of the famous tree climbing lions in the Ishasha sector of Queen Elizabeth National Park. Day 6: Morning Game drive and transfer to Bwindi Impenetrable National Park. In the morning we go for another game drive in a search of the tree climbing lions. We also get to see herds of buffalo, elephants, kobs, oribis, and if we are lucky leopards and the lions. Hippos also live here on the banks of the Ishasha river in large numbers plus a number of birds species. The tour go’s through beautiful terrains in the beautiful Kigezi region before arriving in Buhoma for our gorilla trekking expedition the following morning. Diner and overnight at: Mahogane Springs Lodge/ Silverback Lodge or Buhoma Community Camp. Day 7: Mountain Gorilla tracking in Bwindi Impenetrable National Park. Bwindi is popular for gorilla trekking expeditions as it hosts the rare endangered Mountain Gorillas, a privilege it shares with the Volcanoes National Park of Rwanda and Virunga National Park of the DRC. Over 440 mountain gorillas which is 1/2 of the world's mountain gorillas live in Bwindi Impenetrable National Park including a high number, currently14 habituated gorilla families/grougs which can be tracked by tourists. The Buhoma sector of Bwindi National Park is situated on the North Western corner of Bwindi. Buhoma is popular for gorilla trekking given that it is home to 3 gorilla families which can be trekked from Buhoma as the base. Buhoma has a fair number of very well organised communities run projects which explore the Bakiga and Batwa Pygmies, including their cultural lifestyles, way of life, tribal dances and performances. Same can be experienced through homestay arrangements and natural walks through the local villages. Buhoma offer enriching bird watching opportunities to bird lovers including the chance to see various Albertine Rift endemics e.g the Short-tailed Warbler .Visitors are also able to explore the Buhoma area through mountain biking, hiking through the forest, hikes to the waterfalls and village walks. Day 8: Transfer to Lake Bunyonyi. In the morning we depart from the fantastic Bwindi Impenetrable forest and proceed to our next magical location Lake Bunyonyi, land of the birds. Our journey takes us through beautiful Kigezi undulating hills with the most awesome scenery. We arrive at Lake Bunyonyi in the early afternoon and embark on a boat ride on this most beautiful and picturesque lake Bunyonyi, the 2nd deepest lake in Africa and 3rd deepest in the world. The lake is ideal for swimming for those who want to take a cool dip after a gorilla trek the previous day. Diner and overnight at: Bird's Nest or Lake Bunyonyi Overland Resort. Day 9: Transfer to Volcanoes National Park Rwanda. After breakfast, we depart from Lake Bunyonyi and proceed to Volcanoes National Park Rwanda, via the border crossing of Cyanika. We anticipate arriving at lunch time, and checking into our lodge for lunch. After lunch we spend time exploring the greater Virunga area, visit the twin lakes of Bulera and Ruhondo, visit a local school, local market in Ruhengeri or a cultural Ibi'wacu village to discover local Rwanda culture, norms, practices and entertainment. We may alternatively explore the newly launched caves in Musanze. Diner and overnight at: Mountain Gorilla View Lodge or Gorillas Nest Lodge. Day 10: Morning gorilla trekking or Golden Monkey tracking. Transfer to Gisenyi. After a very early breakfast you may go for gorilla trekking again, this time in Volcanoes National Park. For clients who do not wish to trek twice, we embark on golden monkey tracking through the forest or visit the Dian Fossey grave. We later return to the lodge for lunch and afterwards transfer to the lakeside town of Gisenyi on the shores of Lake Kivu. Diner and overnight Lake Kivu Serena Hotel or Paradis Malahide Resort. >/p>Day 11: Lake Kivu Gisenyi-Congo Nile Trail & Boat Ride. We wake up very early and participate in the Congo Nile Trail and visit local villages in the Gisenyi area close to the DRC border town of Goma. We later return to the hotel for breakfast and later have a boat ride on the lake or other water sports activities on Lake Kivu including swimming, jet skiing, kayaking, beach volleyball etc. Day 12: Transfer to Kigali. After breakfast, we transfer to Kigali. Arrival to Kigali and then we embark on 3 hrs Kigali city tour which includes a genocide memorial visit, shopping for crafts at Kimironko market and later connect to the airport for your outbound departure flight.